Everyone has a budget in mind when they go to buy a watch. You could be looking for a more affordable timepiece around £100 or so, for this budget you’d likely be looking at a quartz watch from China. Others will be after a luxious Swiss timepiece with a high quality automatic movement. Either weay, picking out the right watch for you is no easy task. We’ve put together a list of the best men’s watches under £100, £200, £500, £1000 and £5000 and included some of our most recommended brands for you to take a look at. With over 1000 articles about watches on The Watch Blog we’re sure we’ll be able to give you a helping hand. If you’re after an affordable watch with a resonable budget of around £100 – £200, maybe even as much as £500 to spend then you might not think you can get a very high quality watch, but in reality there are plenty of extremely good watches available in this price range. You can pick up quality watches that offer value for money from brands such as Citizen, Seiko, and Tissot. If you’re the adventurous type then a G-Shock from Casio is always worth considering as they are some very hardy timepieces. If you happen to have a much higher budget and are looking for a luxury Swiss watch between £1000 – £5000 or maybe even more then some of the best watch brands include Omega, Rolex, Tag Heuer and if you have a very high budget a Hublot or Patek Philippe. Personally, I have a couple of Omega timepieces that I picked up second hand, overall I’ve been very pleased with these. 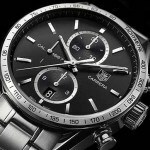 I hope you enjoy having a read through of some of these top watches for men. As always let me know what your favourite are in the comments section below. If you have a budget of £100 for a watch then I wouldn’t be expecting to get a Swiss timepiece and you may even struggle to find many automatic watches you like the look of in this price range, that being said, you do still have an awful lot of choice available to you. If you are looking for an affordable automatic watch then I recommend the Seiko 5 collection. I’ve recently updated my top 100 best watches under £100 list where I featured many of the most popular watches in this price range so if you’re looking for the best budget watches, this is where you should head. If you have the time I highly recommend checking it out, you can even just skim through and see if anything takes your fancy. You’ll most likely be looking at timepieces that use a quartz movement. These are often very accurate movements that make use of a battery for power, this is different to the likes of an automatic watch that used a sprung mechanism. Features to keep an eye on in this price range are the type of glass and the water resistance ratings if that happens to be important to you. Most watches are likely to have a mineral crystal glass, this is specially hardened to offer you a decent level of scratch resistance. You may occasionaly spot a watch with a sapphire crystal glass, this is much better in terms of scratch protection but it doesn’t have quite the same level of shatter resistance. 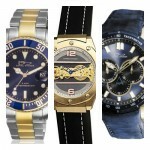 When it comes to watch brands under £100 I’d recommend taking a look at the likes of Seiko, Fossil, Casio and Invicta. If you really are simply after a basic timepiece for telling the time then you can’t go far wrong with the Casio F-91 which is very cheap and affordable, you’ll notice I recommend it often on this site. 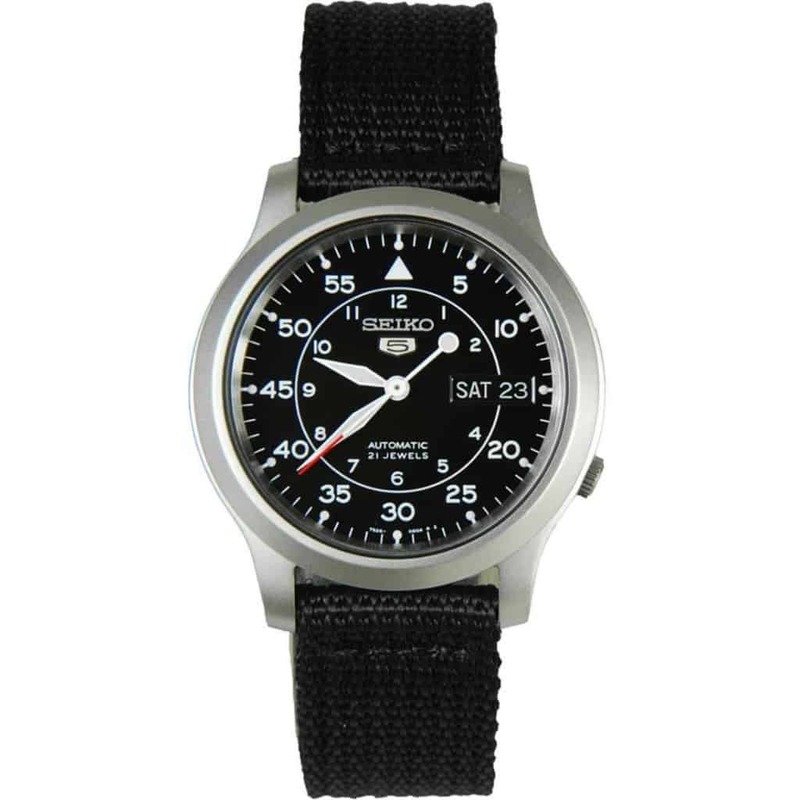 There’s no denying that the Seiko SNK809 is one of the best value for money watches you can pick up for under £100. In the past I’ve done an in depth Seiko SNK809 review where I look at the watch in detail, I’ve linked off to it if you do want to find out even more about this amazing watch. The Seiko SNK809 is part of the Seiko 5 series which overall I highly recommend as you’ll find the whole collection really does offer very good value for money, so they’re great for people on a budget. This is an automatic watch powered by a 21 jewel mechanical movement. The dial has a high visibility design that makes it easy to read, there’s also a day and date display on the right hand side which can often come in useful. The downside to this watch is that it does only have a 30m water resistance rating, but that may not matter to a lot of you. I happen to be a big fan of the exhibition glass caseback, from the rear of the watch you can see how the automatic movement works, it’s a pretty cool feature in my opinion. Another thing to note is that the Seiko SNK809 is a smaller watch with a casing diameter of 36mm, some people might not be a fan of this. Up next we have a selection of brands for anyone with a slightly larger budget of around £200. You’ll notice a fair amount of designer watch brands in this range. I don’t mind the odd designer watch brand myself, but many watch enthusiasts won’t touch them. There’s no denying that you are paying quite a bit towards the brand name, but that’s something I don’t mind doing to be honest. Designer watch brands such as Hugo Boss, Michael Kors, Tommy Hilfiger and Armani are all very popular in this range. If you’re not a fan of designer brands then I’d recommend looking at Seiko, Citizen or perhaps even Bulova, these all make good watches for men. If you’re buying a watch as a gift it’s very important to try and find out what type of watches they already like. If you spot many designer branded timepieces in their collection then it’s safe to assume that they’re happy with this type of watch. If on the other hand you see brands like Seiko, Citizen etc then I’d stick to matching up with one of the brands they already have and would avoid buying a designer watch. It’s tough picking an overal favourite watch to recommend in this price range. There were quite a lot of Seiko watches in this price range that are well worth considering, I didn’t want to keep featuring the same watch brand all the way through though. 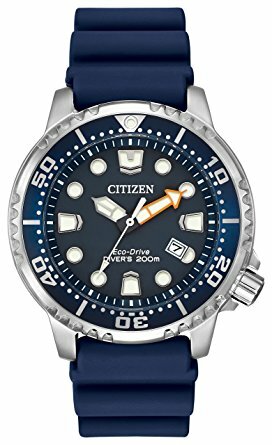 I’ve decided to pick out this diving watch from Citizen. This timepiece from Citizen features the very popular Eco-Drive technology. This means it uses light to power and charge up the device. This technology has proven to be so popular that Citizen now feature it in the majority of their new watches. The watch has a nice 42mm casing diameter with a stylish turnable bezel. The hands are coated in lume too for better visibility in dim lit conditions. This is a popular diving watch as the timepiece has a diver’s 200m water resistance rating. Ideal for most people. With a £500 budget for a watch you can start looking at an even wider variety of timepieces. Many quality automatic watches are now available as well as quite a lot of affordable Swiss watch brands. Okay we’re still not really at the level where we can look at new Omega or Rolex watches we are at least getting a little closer. One of my favourite articles I’ve ever put together is my top 100 best watches under £500. In that list I looked at a huge selection of timepieces making sure I feature something for everyone no matter what you’re style is. Watch brands you can start adding to your list now include the likes of Certina, Hamilton, Ingersoll, Victorniox Swiss Army, Junkers, Junghans and Raymond Weil to name just a few. If you like miniamlist watches then Junghans is the brand to check out, the have some absolutely stunning minimalist watches for under £500 available. For more best watch under £500 I’ve selection a Hamilton timepiece. These are one of the best Swiss watch brands available within this price bracket. 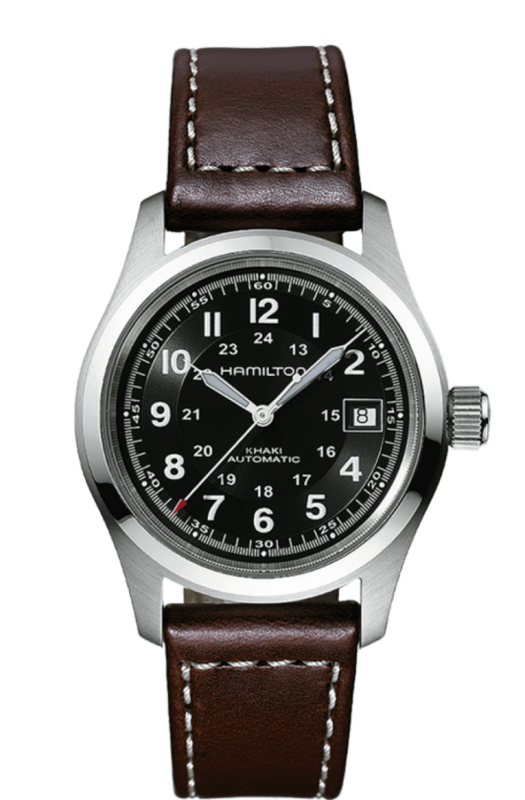 The Hamilton 38mm Khaki Field timepiece is one of the best selling watches for this brand. This is a Swiss made automatic watch that’s powered by an imprssive ETA 2824 movement. This highly accurate Swiss automatic movement can be seen through the rear of the timepiece as it has an exhibition style caseback. The genuine leather strap has a soft feel to it and is finished with contrasting stitching and has a buckle closure. 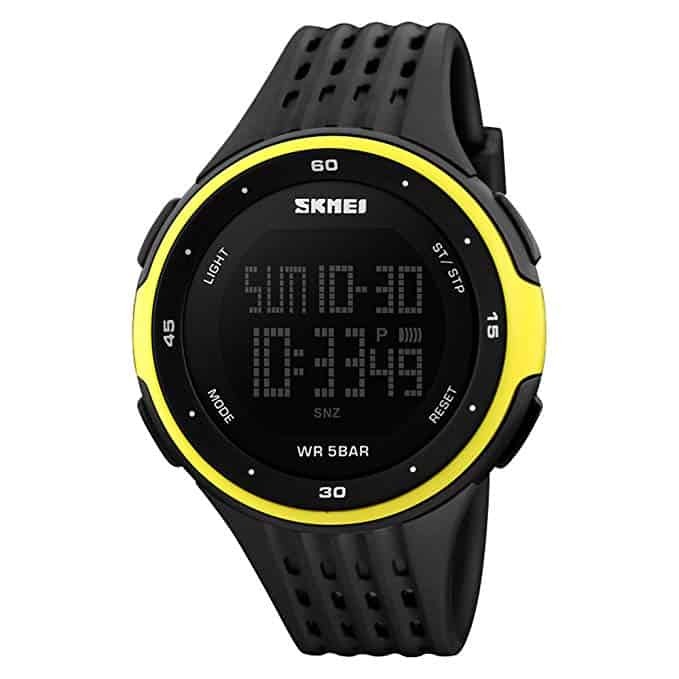 It would also be worth checking out the range of radio controlled watches in this price range. Radio controlled watches are extremely accurate timepieces that make use of radio technology to sync up to atomic clocks. If you’re looking for an automatic watch in this price range then I really do recommend taking a look at my 100 best watches under £1000. In this list I featured many of the best watch brands available, I stuck to automatic and again it’s in a very simple easy to skim through list for you. With £1000 you could consider second hand luxury watches. I picked up my Omega watches for under £1000 each when I bought them. and as I mentioned earlier on, I’ve always been very happy with them. At this price range I’d personally avoid looking at designer name brands, there are many nice watches available from Gucci for example, and I have recommended them in my top 100, but if you’re after the best and value for money then stick to looking at the independent watch brands. I’d many be considering automatic watches over quartz watches in this price range, but obviously that comes down to taste. If you happen to have a collection of automatic watches I just came across this awesome looking watch display cabinet. I just had to include it here as a little added extra for you to see. 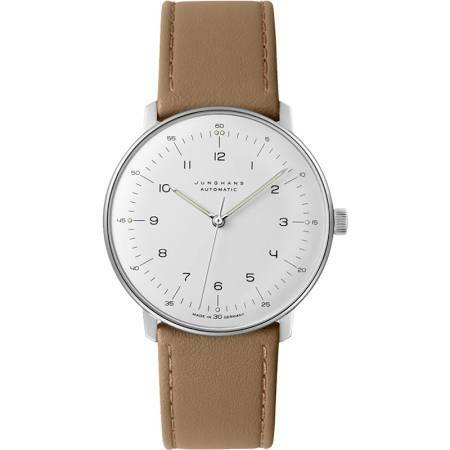 I’ve gone for the Junghans Max Bill as my top pick for watches under £1000. Many people in the horology community will have heard of the Junghans Max Bill. It’s a stylish miniamlist watch that has a variety of options available when it comes to straps. In this instance I’ve picked the genuine leather edition. Powering this men’s wtch is a self winding automatic mechanical J800.1 movement. A curved Sicralan coated plexiglass protects the timepiece from scratches and gives you watch that vintage feel. Junghans are actually a German brand and as such the automatic movement is German made. Now we’re really getting into it. With this sort of budget you can easily go for many of the most popular luxury watch brands. It’s no small thing buying a watch as expensive as this so make sure you take the time to do your research. I find you can often get tons of information from the many watch forums that you can find online. In this sort of price bracket I’d consider taking a look at brands like Omega, Tag Heuer and Breitling depending on which sort of watches suit your style best. You may also be able to start taking a look at some second hand Rolex watches if that’s what you prefer. 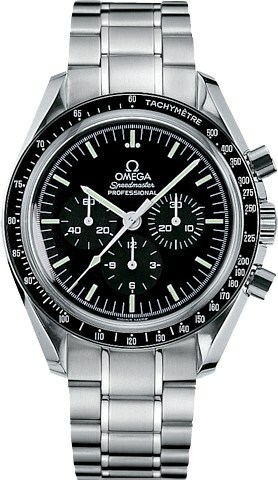 If you love the Omega watch brand than I’m sure you would have heard of the Omega Speedmaster collection. This is a very luxurious chronograph watch that fits nicely within the £5000 budget. The most iconic use of watches in films has to be James Bond and his Omega timepieces. The model below may not have all those high tech spy gadgets but it certainly ticks all my boxes for what I’d require from a high end luxury watch. This is a high end Swiss may watch, with the correct care over the years it’s the type of timepiece you can hand down to other members of your family. If you’re lucky enough to be searching for a timepiece in this price bracket then I’m certainly a little envious of you. People typically think of the higher end Swiss or German brands first off. I’d be looking to take my time with this. Are you after a classic antique watch that will hold or grow in value? Watches as investments have become popular over recent years but you really do have to know what you’re picking. A Rolex would be on my list for sure, but then again, most people with this sort of money already have one of those, maybe you want something a little different? In that case you’d want to consider a Patek Philippe or a Vacheron Constantin for something people can really admire. Lange & Söhne are a very good German watch brand that I’m the fan of so I’d recommend checking them out. If you happen to be a big fan of pilot style timepieces that defintely check out Breitling watches, they’d have everything you require. I decided to settle for a Rolex as my most recommend timepiece in this bracket. 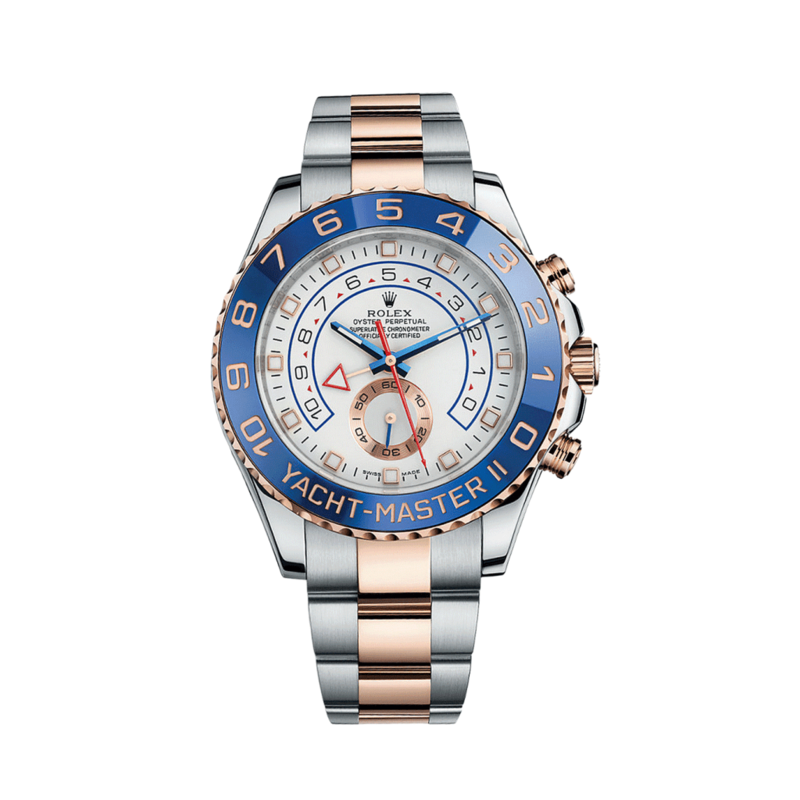 The Rolex Yacht Master II stands out very nicely on anyone’s wrist. This is one of my personal favourite Rolex watches to be fair. It’s powered by a high end Swiss automatic self winding movement as you’d expect to see in a watch from this price range. In all honesty the watch is simply beautiful from every angle. Hopefully you now have a bit of a better idea about what sort of watch you should go for depending on your budget. Overall I think there’s a decent sized selection of good watch brands for men. Of course I wasn’t able to include every brand, that’s why I recommend taking a look at many of the other useful resources on this site.